This was my first trip to South Africa, and it far exceeded my expectations. I spent three days at the Thornybush Game Lodge in the Thornybush Nature Reserve and while there went on six amazing safari game drives. In my wildest dreams, I never thought I would see so many animals so up-close. The animals were everywhere — they were unfenced, free to roam, and mostly oblivious to us camera wielding tourists. 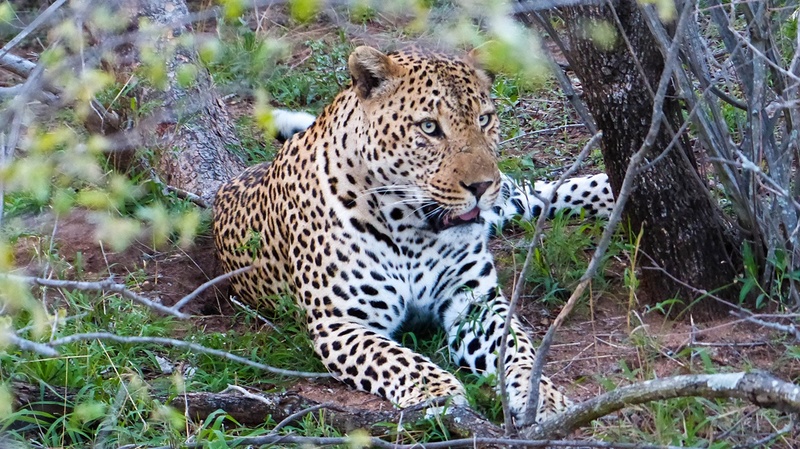 This beautiful Leopard was neither interested in nor afraid of us at the Thornybush Nature Reserve. Can You Do Thornybush Without a Tour? 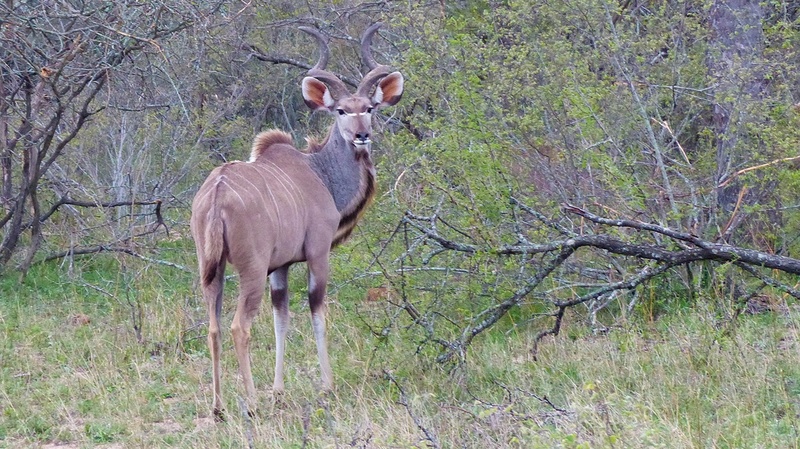 Have you ever been on a safari searching for the big 5 animals of South Africa? One of the best things about a Big 5 animal safari is the people; left to right, Henny (our Ranger/Guide), Ginny Vail, July (our Tracker). 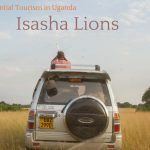 Every morning, beginning at 5 AM, and every evening, beginning around 4 PM, we headed out for 2-3 hours in a totally open Toyota Land Cruiser driven by a ranger and guided by a tracker. The Land Cruiser really was totally open: no doors, no windows, no roof, and no roll bars. We had a completely unobstructed view. Moreover, our guide quite frequently went off road into the bush over trees and logs and down dry riverbeds. More than once, we were completely surrounded by elephants as they paraded in front of us and circled around behind us. I don’t have the words to explain how incredible this was, and, except for one cranky bull in musk, the elephants ignored us. Elephants, lions, leopards, rhinos, and Cape buffalo are the Big 5. This term is from the bad old days, when South African animals were frequently hunted for sport; these were the most prestigious to kill because they were the most dangerous to hunt. Although most of us only shoot with cameras now, the term is still used in safari ads. Wild dogs are not that common, and we were lucky to see them, even though they are not one of the Big 5 animals of South Africa. We saw all five at Thornybush, and we also saw much much more. There were several varieties of antelope (including impala, wildebeests, and kudu), several varieties of birds, baboons, crocodiles, giraffes, hippos, hyenas, monkeys, wild dogs, and zebras. Looking back on our Thornybush Game Reserve safari, I can’t wait to go back! Thornybush Nature Reserve was originally created for big game hunters, but now it’s strictly for viewing and photography. 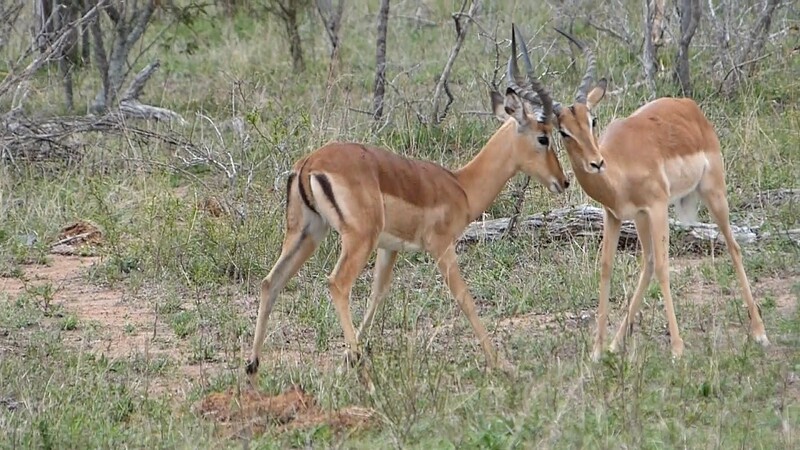 The reserve is adjacent to and affiliated with greater Kruger National Park. Thornybush Game Lodge and other lodges in the area are private eco-lodges and are essential to supporting the animals and the reserve they thrive on. 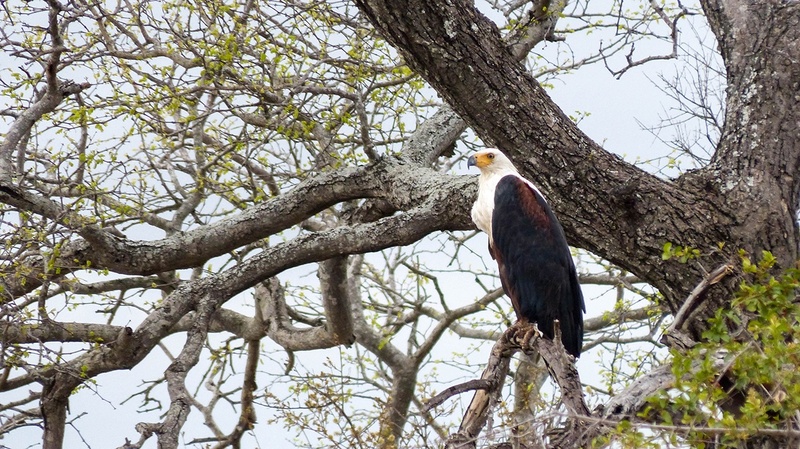 African eagle perched high overlooking the goings on of the Thornybush Game Lodge. Thornybush Game Lodge overlooks the seasonally dry Monwana River. The rooms are individual bungalows that line the riverbank like a string of pearls. The bungalows are large, plush, and comfortable, and they have beautiful views of the riverbed and the animals, especially a cheeky troop of baboons, who hangout there. The food at the lodge is really great too with lots of dishes prepared using fruits and vegetables from local community gardens. This is another win for the game reserve because local growers sell their produce to the lodges and the lodge guests get wonderfully fresh food. Thornybush Game Lodge costs several hundred dollars per person per night, so it’s expensive. I’m normally a budget traveler, but I found it easy to rationalize the cost. The game lodges support the reserve and provide good jobs for the local people. The reserve provides safe habitat for the animals and protects them from hunters and poachers. The animals are here in abundance and are free to go where they please. The price included a beautiful and spacious room, all of our food and drink, and two game drives each day. This is truly the adventure of a lifetime, and, for me, it was well worth the cost. There were independent travelers, including families with children, at the lodge who had driven there on their own. There were also other lodges in the reserve that appeared much more rustic and are likely less expensive. 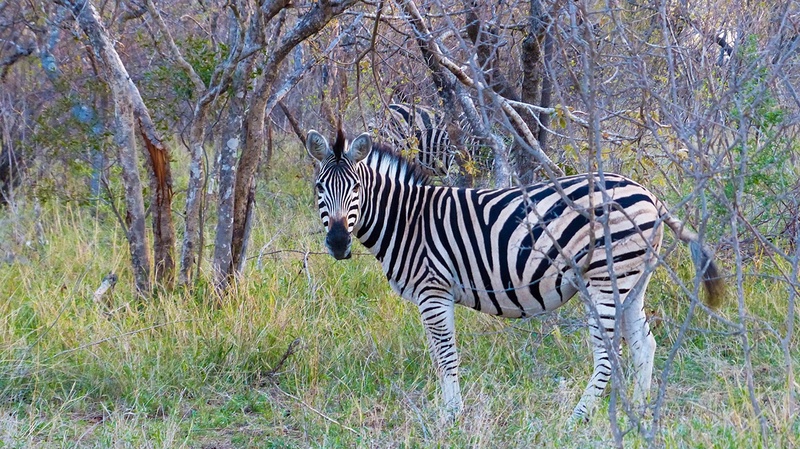 Zebra, your camouflage is good, but we still see you. I traveled on a tour with my Alumni group, so all of my transit and lodging arrangements were prearranged. 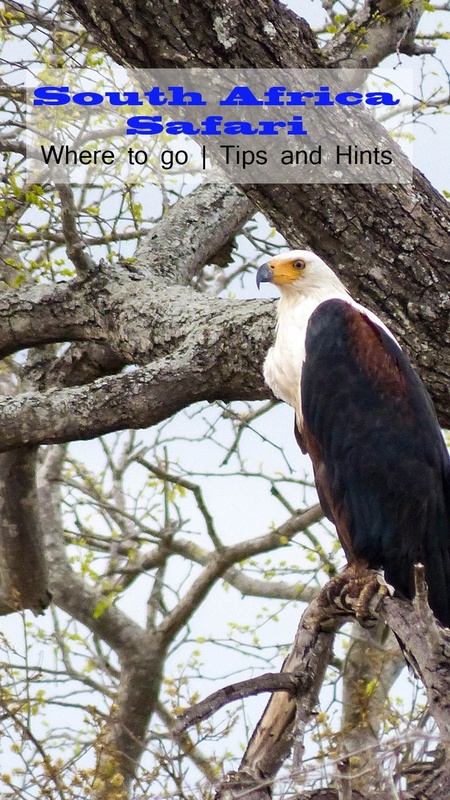 We flew from Cape Town to Hoedspruit and then traveled by van to Thornybush Game Lodge. The van ride took about an hour and much of it was on gravel roads. An alternative would be to fly into Hoedspruit or Johannesburg and rent a car. 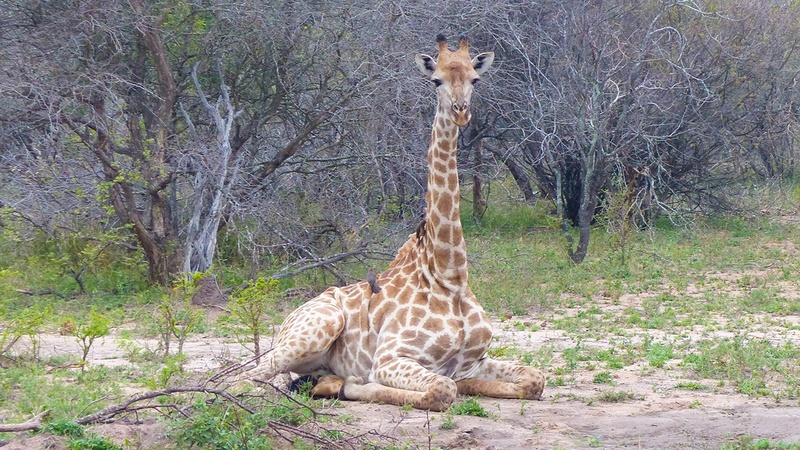 On our Thornybush safari, we viewed this giraffe, comfortably lying down while oxpeckers clean away the ticks. Note from Corinne: As you know, Jim and I have been on numerous self-drives and safaris in different parts of Africa. 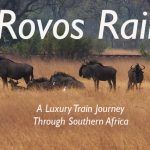 Check out these posts if you are interested in safaris in Botswana, Zambia, or Uganda. Pin Thornybush Game Reserve for later planning! I am a native Californian and retired telecommunications manager who loves all aspects of travel, even the challenging stressful parts when arrangements don’t quite go as planned. I'm an avid sightseer and amateur photographer; my travel interests include history, art, language, food, and, of course, people. I've been to 43 countries on six continents — including 20 trips to Europe. Have never been on a safari. It is one of the things on my bucket list. Jules. Going on safari is amazing! I hope you will get to do it one day. Jules, thank you for your comment. I hope you do get to go on safari. This was really high on my bucket list and it did not disappoint. Such a great experience! We went to Kruger a few years ago and absolutely loved it. Definitely a bucket list item checked off. And as you pointed out, you can travel there independently and (at least in Kruger) stay in the park accommodations. They aren’t luxurious, but they are affordable. I worry some people miss out because they imagine it costs a fortune. Megan, I do think no matter where you are, safaris can be very expensive, but there certainly are ways to cut costs as well. Megan, thank you for your information about Kruger. I would have been totally happy in less luxurious accommodations. For me, the game drives were everything, and it’s certainly doable to go there and see the animals in a much more affordable way. Exquisite moments you have captured in your blog. Thanks for this. Thank you Ansh. There were a lot of exquisite moments on this trip, and I’m really happy I could capture a few on camera. Gosh, what a visit, your photos capturing your stay are beautiful. So glad you got to see the Big 5 and much more – I think appreciating nature is so important! The lodges sound great too, I might have to start saving! Rachel, thank you for your comment. It was wonderful seeing the animals, and it was also very satisfying to see how much the rangers and trackers respected the animals and protected their habitat. Jill, it was a dream come true. I’ve wanted to go on safari since I was very young. It was amazing, and I’m so glad I finally did it. I have not been to South Africa yet but when I go, wildlife viewing will be one of the top things on my list. Thornybush Nature Reserve sounds very accessible. I like the idea of staying at a lodge nearby so you can get up early in the morning for guided tours. Rhonda, thank you for your comment. When you go to Africa, I do hope you go on safari. I was able to see and do other things on this trip, but the game drives were tops on my list and staying at a lodge also helps protect the animals and their habitat. This is one of my dreams, being able to go to South Africa on a safari. Were you ever scared that something might go wrong? The photos look awesome and it feels like you were pretty close to them! Dany, thank you for your comment, and I do hope you get to go on safari. The animals were very close. I wasn’t more than 10 meters from the pair of young male lions you see in the video, but they were not at all interested in me. Oddly, the only animals that I was a bit afraid of were the baboons. They were frequently running on the roof and across the deck and trying to get into the bungalows. I love the videos, especially 1:34 of video 1. 🙂 It’s the next best thing for someone like me who haven’t been on a safari yet. I’m hope to finally experience that in my planned trip to Sri Lanka early next year. Good to hear that this habitat has already been protected from hunting and supported by game lodges. Jing, thank you for your comment. The leopards were my favorite too. I got a few decent leopard photos, but everytime I tried to take a video, all I got was the backside of the leopard disappearing into the bush. I hope you get to go on Safari, and I hope I get to go to Sri Lanka. It’s on my list. Amit, thanks for commenting. A night safari would be very cool, especially if you could see different animals and also have a clear view of the stars. I hope an African safari makes it to the top of your list. Carmen, thank you for your kind comment about the photos. You will love South Africa. The animals are truly magnificent and the people and food are great too. Happy travels! Danik, thank you for your comments. The safari was amazing, and it was also a lot of fun. 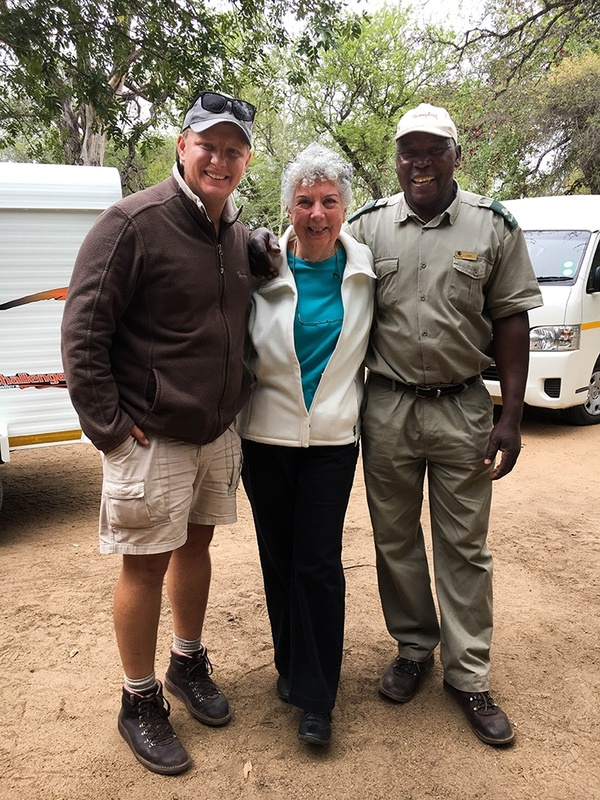 We had the same Ranger/Guide, Tracker and group of people in the Land Cruiser on each of the six game drives, so we got to know each other a bit and that created a very friendly and fun atmosphere. I hope you do get to go on safari and see a lot of animals, especially tigers. Your pictures and narratives have fueled my South Africa dreams. Saw some but not all of the big 5 in Rwanda East Africa. But South Africa is indeed the stuff that dreams are made of. The Thornybush sounds like a good company to embark on a safari. Sandy, thank you for your comment. 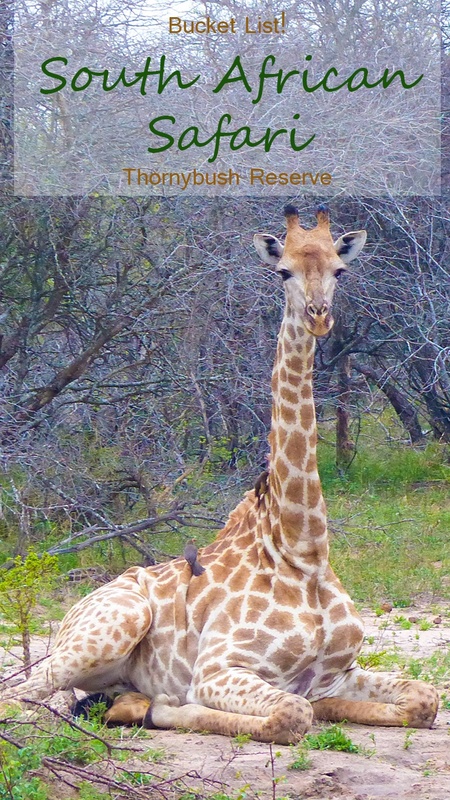 You won’t be disappointed if you visit the Thornybush reserve in South Africa. The rangers there really know how to provide a great experience for their visitors. I hadn’t considered Rwanda; maybe it should be on my bucket list. I have not been on a safari but it is on my list as I so enjoy seeing animals in the environment they were born to be in. I didn’t know there were wild dogs there, their colors are really cool! Lara, thank you for your comment. 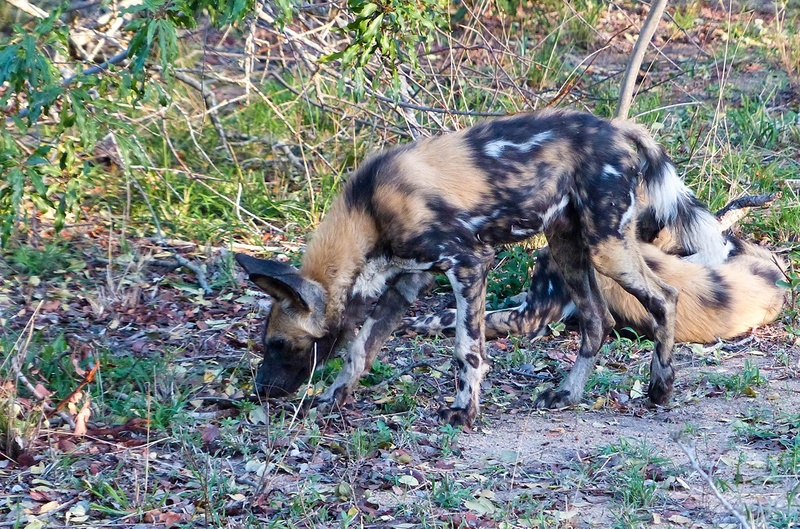 I didn’t know about wild dogs either until I saw them at Thornybush. We saw them a second time while they were on a hunt. The whole pack ran right past us in single file. I was so excited to see them that I failed to push the video button on my camera and missed the shot. Their colors are very cool. Yet to get to Africa and see the big 5 on a safari. Seeing animals in their natural habitat reminds me of how complicated we have made our lives as humans. Don’t you think so? Cobbledroads, thank you for commenting. I certainly agree that we’ve made out lives too complicated. 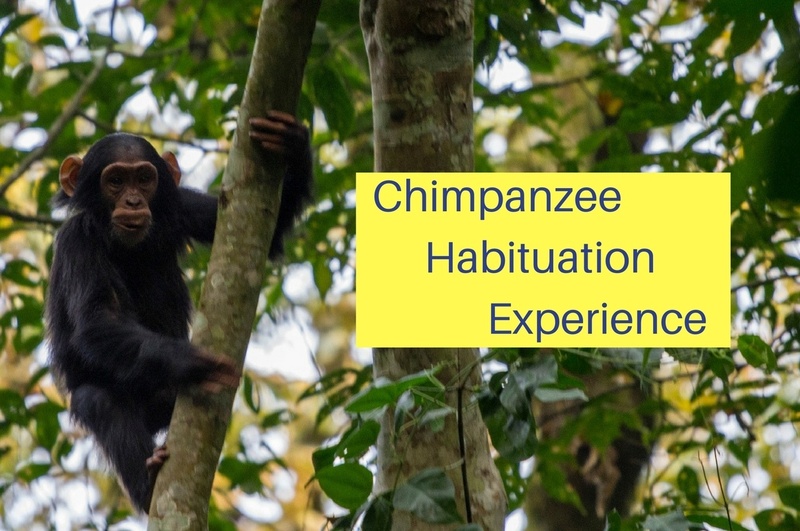 Seeing the animals in their natural habitat makes that case and so does visiting places where you see beautiful, healthy, children who live in simple huts and have none of the trappings and toys we have, yet they laugh and play and seem very happy. Thank you Alphabeyond. I hope you have a great trip. The world seems to be in love with African safaris at the moment, us included. I am thinking of trying to do one next year so am hungrily devouring all info I can get as there are so many different parts of Africa and so many different experiences. This places looks incredible so it will definitely make my list of ones to check out more when I am ready. Kerri, thank you for your comment. If it’s not already on your list, check out Chobe National Park in Botswana also. I spent two days there and loved it, especially the boat cruises on the Chobe River. See Corinne’s post about Chobe’s swimming elephants.